Slides -- the shoe of the summer, thankyouverymuch Phoebe Philo and now everyone else who has followed suit for summer 2014. While most of my fashion cohorts have opted for the height of the trend's incarnation: the classic and otherwise frowned upon Birkenstock, something about this one just had my instincts veering toward a less literal option. Despite these oversized crisscross bands of plastic (sneaky Swedes) erected on a cork sole being a crossbreed of Céline, Isabel and the most polarizing German shoe in history, I am confident that my lack of commitment for this trend will leave me feeling extremely content by summer's end. You know, when everyone will be discarding it due to overexposure, kind of like fashion's very own Let It Go. So here I am, being as simple as it gets in black and dark indigo. Adding a dash of dynamism is the result of my reaching for the scissors prior to leaving the house for a little trim 'round the ankles. Makes things less mundane, wouldn't you say? I haven't completely jumped on this bandwagon either--- but I do like the criss cross on the H&M shoes, and think they are a great answer if you aren't totally sold on the look. As for your styling-- casual and cool--- well done! I don't think I would manage to pull them off as brilliantly! Now THOSE are cool! They look so good on your feet. You can tell good one's from poorly tailored ones. Perfect weekend casual look. I love it! Let's follow each other via GFC? 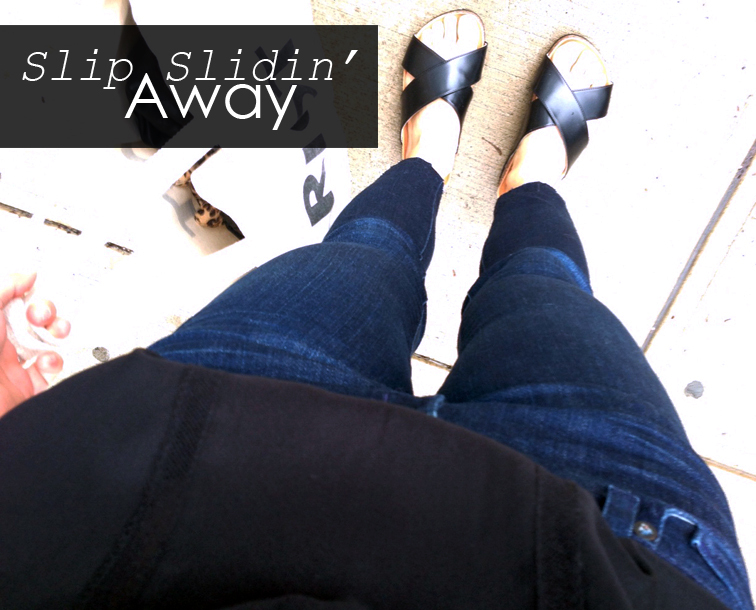 These slip-in sandals are such a trend lately! Oh I want a pair, these are gorj! I am a big fan of it. Seems most fashion trends start in cities like NY, London and Paris and what do they all have in common? They are cities where everyone walks so this is not surprising. On Monday I was walking around all day in these flimsy no support sandals and my legs, knees, ankles and feet were killing me. It was like I walking directly on the pavement all day. So yup I wil take a pair!